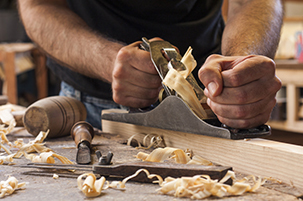 The craftsmanship of our carpentry services is unmatched because our professionals are equipped with the latest tools and products to give your house the best finish. From door installation, window fitting, reshaping and molding of a cabinet to construction of external and interior furniture, our professional carpenters do it all. Our well equipped, trained and experienced carpenter are ready to assist you in any kind of job be it furniture making, assembling/dissemble, installation and repair job. Carpentry from minor work like drilling to major work like making a bed. Our carpenter understand the value of your investment in home or office infrastructure and how it needs to be maintained. So leave your worries because your work is being taken care off by Taskman’s whose work is in itself a Masterpeice. Give us your house and we’ll turn it into a masterpiece.